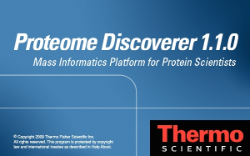 News in Proteomics Research: Where do I get Proteome Discoverer nodes? Have you watched some of my videos or seen my screenshots and thought, "where the heck do I get all those cool nodes you are using?" Not the first time I've gotten this question! The always-powerful and extremely useful Preview and Byonic nodes are the products of Protein Metrics. Preview is a free program and you'll need to have stand-alone Preview and the Preview node installed to use it. You'll have to have a license for Byonic (or the 30 day free trial) installed to use the Byonic node. You can link to Protein Metrics here. There are more on the way and I'll put them up when they are something you can use too! Thanks for the reference provided here! I will check it out later. Any word on any kind of De Novo Sequencing Node coming to PD? Sorry, nope, I haven't heard anything regarding de novo in PD. One day maybe?